One of the issues when running web-based tests is the nature of modern browsers to automatically install updates. This means any sustained period of benchmarking will invariably fall foul of the 'it's updated beyond the state of comparison' rule, especially when browsers will update if you give them half a second to think about it. Despite this, we were able to find a series of commands to create an un-updatable version of Chrome 56 for our 2017 test suite. 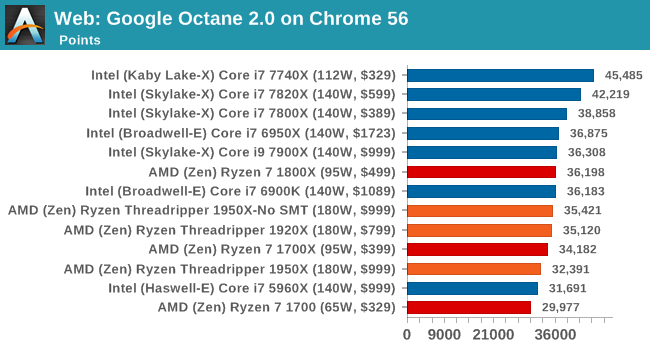 While this means we might not be on the bleeding edge of the latest browser, it makes the scores between CPUs comparable. Along with Mozilla, as Google is a major browser developer, having peak JS performance is typically a critical asset when comparing against the other OS developers. 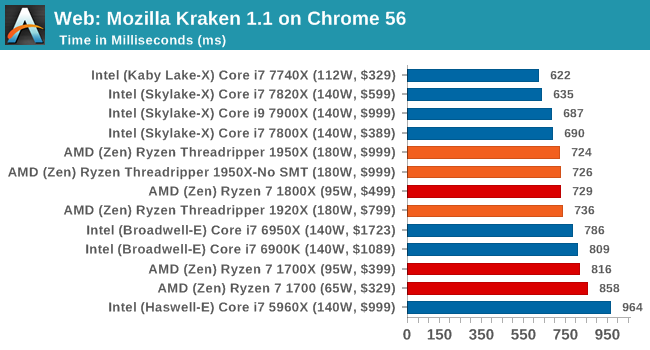 In the same way that SunSpider is a very early JS benchmark, and Kraken is a bit newer, Octane aims to be more relevant to real workloads, especially in power constrained devices such as smartphones and tablets. 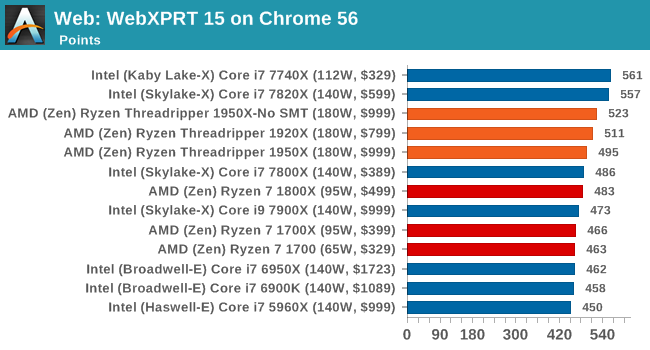 While the previous three benchmarks do calculations in the background and represent a score, WebXPRT is designed to be a better interpretation of visual workloads that a professional user might have, such as browser based applications, graphing, image editing, sort/analysis, scientific analysis and financial tools. Overall, all of our web benchmarks show a similar trend. 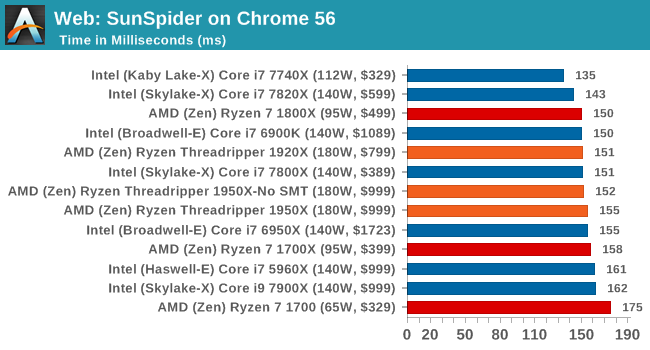 Very few web frameworks offer multi-threading – the browsers themselves are barely multi-threaded at times – so Threadripper's vast thread count is underutilized. What wins the day on the web are a handful of fast cores with high single-threaded performance.